Do you work for an organization that clearly sees the link between IT services and corporate revenue, where IT is recognized and rewarded for those contributions to revenue? If so, you can stop right here. Congratulations. You belong to an elite group of organizations that exist only in the fantasies of the rest of us. If you don't belong to such an organization, chances are you struggle with how to define IT's value in ways that get the attention of your partners in the rest of the business. I belong in the second group, and it appears most IT service managers do as well. It's a concept I will address frequently, and from different contexts. Lately I've been looking into the context of service quality. We all know that our shop delivers great service quality (right? ), but how do we show everyone else? My assertion is that we spend way too much time assessing technology, or how well our processes fit one of the frameworks/standards , to really see what the business sees. Of course we provide excellent quality! We've been verified by <fill in the blank> to prove we have the best <fill in the blank> possible! This is IT navel-gazing at it's worst, and does almost nothing useful around determination of service quality. I'm not knocking external certifications or verifications. They can be great tools, but only if the rest of the business already buys into the fact that they measure something of value to the business, not just IT. I came across an excellent series of blogs written by John Custy (@ITSMNinja on Twitter) addressing the topic of Service Quality Management in IT Service Management (Part 1, Part 2, Part 3). He applies the SERVQUAL model from the world of market research. The ultimate measurement of quality is the gap between a customer's service expectations and their perception of the delivery of the service, or Gap 5. It helps us see where things we can objectively determine, like the customer's expectations vs. service strategy (Gap 1), will ultimately affect quality of the service. 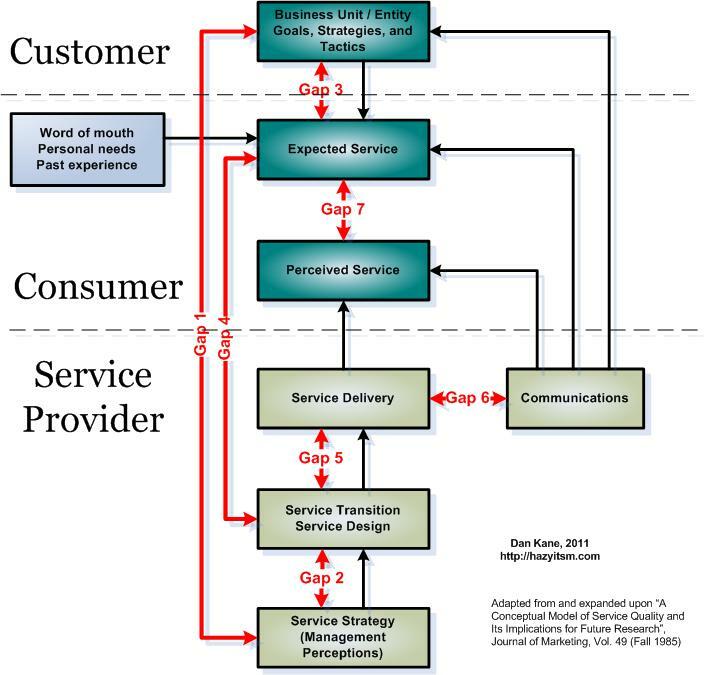 The model does an excellent job of describing the context of Business-to-Consumer (B2C) customer service. However, I believe it falls down when considering internal service management and Business-to-Business (B2B) service management. There is an important element missing from the customer side of the model: the requesting Business Unit or Entity. Specifically, the goals, strategies, and tactics of the business entity. An argument could be made that this is just another set of inputs that impact customer expectations, and that's likely true to an extent. What that argument misses, however, is that we're usually talking about different people setting the business strategy and tactics, vs. the people making the specific service request. That's the reason we have Service Strategy and Service Transition/Design as separate entities. We know that Service Strategy is not just an input into how we design services. It is an entirely different process done at a different time, frequently by different people. An example might help. We've negotiated an SLA around a service that says processing of a critical task will complete within 30 seconds or better 90% of the time. During service design, we looked into beefing up the infrastructure so that processing could be completed with 10 seconds 90% of the time, but the added cost was deemed as unnecessary by our partners in business leadership. Now a line supervisor complains that the critical task is taking too long. When investigated, we find that the task's performance for this department falls within the 30 second standard, well over 90% of the time. There is definitely a large gap now between Expected Service and Perceived Service, which is our core determination of quality. The primary reason here is the gap between executive leadership expectation and the expectations of the individual service requester. The point is that the new "gaps" are things that we can measure, we can influence, and they do influence perceptions of service quality. Let me know what you think in the comments. I want to continue the discussion around how we use the gaps to create metrics that can be used to measure quality of our services. I like this, service quality is so lacking in our industry and we need more I.T. people to open their minds up to the importance of it for business. We forget we are "services" and our bread and butter comes from the our customers, internal and external. Interesting ideas - though I think the real issue in this case is the difference between what the business is willing to pay for and what the line supervisor desires? If this is true, then isn't the responsibility of management to convey this message (I know real world vs. what it should be) to the line supervisor, and explain why this level of service is appropriate (not necessarily the service providers role). If we assume good communication - then the two should be in sync? Thank you for posting this. I have recently become aware of SERVQUAL (from ITSkeptic) - so reading other thoughts about it are helpful. I do have a few (probably basic) questions for you. I noticed that for gap 3 it is between the "corporate expectations" and "service requester expectations" - which I understand from your example is the difference between what corporate leadership is willing to accept/pay for and what the staff member thinks they should receive. I hope that is the correct interpretation. For gap 7 - is that the gap between either the corporate or service requester or is it for the service requester alone? The term "customer" is used, but with gap 4 that same block is again referenced as "service requester" which we know from gap 3 is separate from "corporate." I hope my question is making some sense. In essence, I want to know if the block labeled "Expected Service" is the expected service from service requester's, corporate leadership, both, or it depends. Now, if it is just from "service requester's" (which is the same as saying 'staff members'), which, I would think would make the most sense - then the box labeled "Business Unit/Entity Goals etc" is "corporate" or as I've called them corporate leadership. So, both "corporate" and "service requester's" are part of "customers" but they are not interchangeable correct? It is just that gap 7 and gap 1 both use the word "customer" but I do not think they mean the same thing. I'm sorry if I am being particular. I am just trying to have a clear understanding. AMAZING....thank you for GIVING back and sharing this information. Shame there are TROLLS in your comments already. SEE THROUGH THE HAZE OF SERVICE MANAGEMENT WITH HAZY ITSM! Legitimate questions are never a bad thing, so don't worry about being nitpicky, or whatever. Gap 3: Yes, that is exactly what I mean, and what I think is a critical difference between internal vs. external service providers (although you brought up a good "external" example in your blog -- Pizza service, with the dad as the "customer" and the kids as "consumers". I feel this gap is more important than the time it is usually given. Many SERVQUAL practitioners assume that, even if that gap exists, we service providers have no ability to influence it. Any parent that has dealt with a child recently exposed to kids TV commercial programming knows that the gap is real, and that the provider has influence on the gap. Of course, that influence is in the opposite direction, but it's still there. Gap 7: My intention is to look at the gap between the end consumer's expectation, and their perception of the service actually provided. So in your pizza service example, the kids AND the dad are the consumers, and the gap between all of their expectations and their perceptions is what is measured. In the corporate context, when the consumer who requests the service is not the paying customer, Gap 7 influences Gap 3 (or can influence it). Ultimately, my intention is to represent Gap 7 as the gap between the requester's expectation and perception of service received. The requester is the one that interfaces with the service provider. I hope that helps. Good questions, and nice write-up on your blog! Thanks Chris. Giving back is what it's all about. Everybody wins.